Cyclone Microsystems' PCI Express Expansion System allows system developers to expand one x16 or x8 host PCI Express slot to additional PCI Express Slots over an Gen1 or Gen2 x16 or x8 expansion cable. This enables the coupling of cost-effective enterprise host PCs with a high bandwidth, peer-to-peer capable I/O subsystems at 40, 80 and 160 Gb/s. Cyclone Microsystems' PCI Express Expansion System allows system developers to expand one host PCI Express slot to multiple additional PCI Express Slots over a x8 or x16 expansion cable. The expansion cable support bandwidths from 40 Gb/s (x8 Gen2), to 80 Gb/s (x16 Gen2), and up to 160 Gb/s on our newest dual HBA adapter x16 Gen2 products. This capability enables the coupling of cost-effective host computers with a high bandwidth, peer-to-peer capable I/O subsystem. 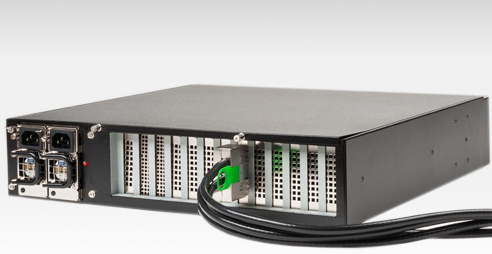 Cyclone's PCI Express Expansion Systems includes a host bus adapter, an expansion cable, and an expansion backplane mounted in an industrial rack mount chassis. A one or three meter cable connects to a gowing list of available PCI Express Expansion Systems. Cyclone currently supports Expansion Systems with four, seven, eight, fourteen, and sixteen PCI Express slots. Several products hav support for dual width GPU cards. The Expansion Systems are plug and play solutions that are host operating system agnostic and require no software drivers. Three generation of Cyclone's PCIe Expansion Systems are deployed in applications as diverse as audio and video editing, data storage, custom embedded systems, seismic exploration, medical imaging, GPU computing farms, and PCIe test fixtures. The common requirement for all these systems is the need to couple a fast server to extensive PCIe I/O slots.